Remarks: Leader of a terrorist organization known as Al-Qaeda "The Base". He walks with a cane. 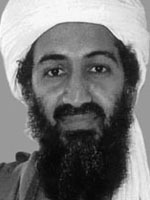 USAMA BIN LADEN IS WANTED IN CONNECTION WITH THE AUGUST 7, 1998, BOMBINGS OF THE UNITED STATES EMBASSIES IN DAR ES SALAAM, TANZANIA AND NAIROBI, KENYA. THESE ATTACKS KILLED OVER 200 PEOPLE.